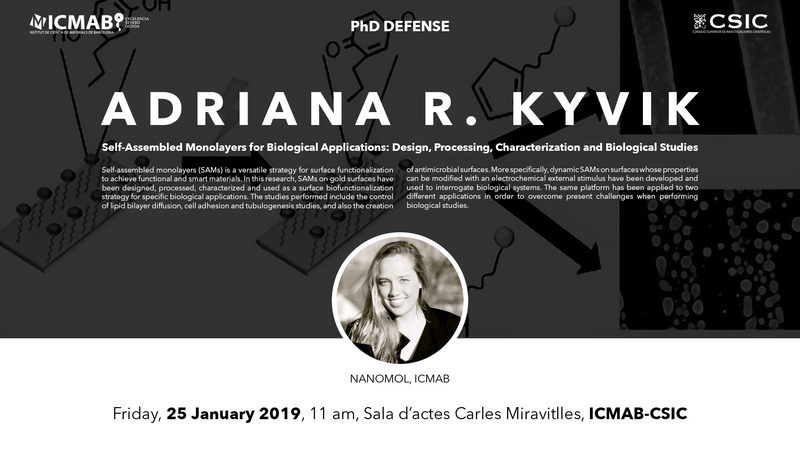 The PhD Researcher Adriana Kyvik from the NANOMOL group at ICMAB will defend her PhD thesis on Friday, 25 January 2019, at 11 am at ICMAB-CSIC. Abstract: Self-assembled monolayers (SAMs) is a versatile strategy for surface functionalization to achieve functional and smart materials. In this research, SAMs on gold surfaces have been designed, processed, characterized and used as a surface biofunctionalization strategy for specific biological applications. The studies performed include the control of lipid bilayer diffusion, cell adhesion and tubulogenesis studies, and also the creation of antimicrobial surfaces. More specifically, dynamic SAMs on surfaces whose properties can be modified with an electrochemical external stimulus have been developed and used to interrogate biological systems. The same platform has been applied to two different applications in order to overcome present challenges when performing biological studies.